Image: Slide from Augmenting Education: The Collision of Real and Virtual Worlds. 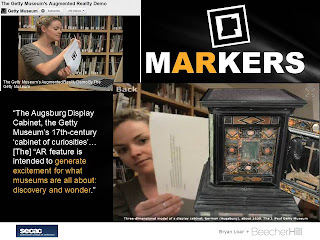 I've compiled a number of nice resources and examples for my upcoming presentation on augmented reality in Diigo. Check them out at bit.ly/secac12-AR. Thank you for sharing your list of resources. It is very helpful in my research on this topic. Thank you for your comment! If your research results in a product (paper/presentation/? ), I'd really appreciate you sharing it.